What makes sprouting so important? Sprouts contain all of the nutrition of the vegetable they will grow into. Just1/4 cup of broccoli sprouts contains all the cancer-fighting sulforaphane found in 7 cups of mature broccoli florets! Add bean sprouts as ingredients to your cooking to make food more delicious and nutritious. JamBer 6 pack steel stainless sprouting kit would definitely turn your mason jar into a kitchen multi-tool! 1.Made of food-grade 304 stainless steel, durable rust free and BPA free. 2.Come with 6 kits so that you can have an ongoing supply of sprouts. 3.Fine mesh screen allows the water to flow out without the seeds coming out. 4.Detachable iron mesh design makes planting happened by removing the mesh. 5.Easy to clean and dishwasher safe. 6.Good air circulation better for more optimal humidity. 7.Perfect size (3.5"outer)for sprouting, straining, or sifting. STEP1:Rinse the seeds,add them to the jar with about 2 cups of water,cover and let soak on the counter at room temperature for 8 hours. STEP2:Drain well,shaking out any excess water,and place in a bowl so that the jar sits at an angle. STEP3:Repeat the rinse,swirl,drain process twice a day(morning and night) until your sprouts are fully formed by taking 3-5 days. STEP4:Once you're happy with your sprout's maturation,give them one last rinse.That's it! 1.Do not leave it in too high or too low temperatures. 2.Make sure to tighten the screws extra tight. 3.Rinse the seeds and or sprouts everyday. Drain well and fluff the contents after draining. 4.Do not place sprouting kits in salt water.Keeping them clean and dry when not in use. ❤Safety Sprouting Lids:Made of food grade 304 stainless steel sprouting system,100% durable and rust-resisting BPA free.Beats using plastic sprouting trays and cheesecloth.Perfect for making organic sprout seeds in your house or kitchen and great for a Healthy Gift! ❤Great Drainage Sprouters:These fine mesh sprouting lid is able to adjust to any size jar for good drainage, allowing for excellent air circulation and easy rinsing both of which are critical for proper growth of sprouts.Grow your sprouts at home for the freshest sprouts at fraction of the grocery store price. ❤Simple and Efficient Cleaning: A perfect size fairly fine-mesh screen allows easy draining and empty the water from the mason jars but no loss of seeds.This fantastic jar sprouting kit keeps the moisture but at the same time open to the oxygen they need,making sprouting so much more simple! It can be boiled and sterilized and fully dishwaher safe. 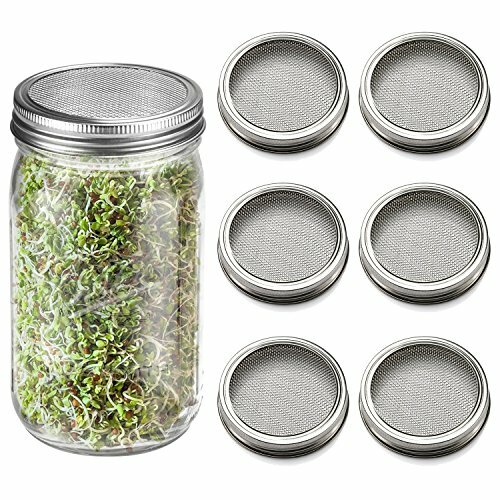 ❤Super Value Sprouting Kit:Each seed sprouting jar kit includes 6 sprouting insert lids and 6 mesh screens fit perfectly on 16/32/64oz wide-mouth canning jars,mason sprouting jars,canning Jars and quart Jars.Indispensable for sprouting 6 day cycle- growing a variety of sprouts and keep a constant supply on hand. ❤Multi Purpose Sprout Toppers:Grow your own organic broccoli sprouts, lentil spouts, bean sprouts and fine enough to use for even tiny sprout seeds including alfalfa with these seed sprouting lids.Perfect for straining liquids such as teas,juices,broths,or for powders such as coco and powdered sugar as well.You can also can plant by removing the iron mesh. If you have any questions about this product by JamBer, contact us by completing and submitting the form below. If you are looking for a specif part number, please include it with your message.